Interior shutters give your home a beautiful appearance from both inside and a great curb appeal outside. You can have a lot of functionality from shutters inside of your home. The three main materials they are made from include hardwood, vinyl and composite wood. Custom hardwood shutters give your home a timeless beauty that can’t compare to any other type of window dressings. These are the full spectrum of being classic, modern and traditional to blend in with any style that you incorporate into your home or rooms. The hardwood design gives you many years of life from them in a high quality product. Hardwood shutters work well in a home with an open concept or a great room. They dress the windows with continuity from one room to the next where all of the windows can be seen from a large area in your home. You can choose custom hardwood shutters in a wide variety of color, as they are stained to your preference. Vinyl shutters are affordable for everyone, no matter what their budget is, as they are the least expensive type of indoor shutters. It can help transform your home quickly and stylishly as they take less time to produce. If you need custom shutters in a hurry, then vinyl is the choice that most homeowners make. Vinyl is also a long lasting material so you will get many years out of this type of window covering. Composite wood shutters work well in any home. They look identical to hardwood and have the longevity of vinyl for the best of both worlds. They can be decorative only or be functional depending on your taste. The best options for rooms that have humid conditions, such as a bathroom, kitchen, mudroom or laundry room are the vinyl construction shutters. They are very durable in moist environments and are impervious to high moisture in these types of rooms in your home. Vinyl is long lasting, as it is not subject to crack, peel, fade or chip. Adding vinyl shutters to your humid area allows you to have continuity throughout the home with functionality in mind. Hardwood shutters are lighter in weight, so that they operate better than the other materials in shutter construction. The hardwood provides smooth opening and closing without twisting. Composite wood shutters will also stand up to moisture rich areas in your home, though not quite as well as their vinyl counterparts. Composite wood is termite, rot and moisture resistance for a long lasting window treatment. Homeowners that want a particular color of shutters usually tends to buy this type as you can have them painted in any color you wish. 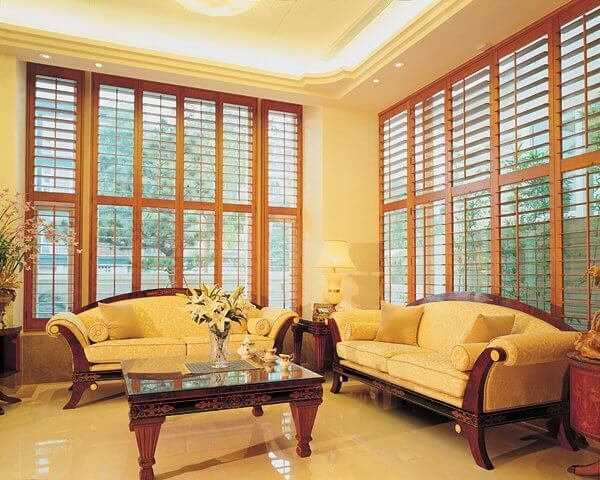 No matter which type of indoor shutters you choose, you will increase the value of your home. When you have customized shutters for all types of windows in all kinds of architecture and you decide to move and sell your home, they will stay with the home and increase its value, as the new homeowners will already have custom-made window treatments. You can use any type of indoor shutters as the first layer of window treatments and add other draperies to soften the look. Shutters don’t hide the beauty of your windows shape or style in any manner, but they compliment it. All types of functional shutters allow you total privacy when closed, the most sunlight when open and are adjustable so the sunlight doesn’t reflect on television or computer screens. You can’t go wrong with any type of custom shutter and we at Sunshine Draperies have experts to help you in your decisions.